Who Wants To Be A Contest Host? Otakuthon is Quebec's largest festival celebrating Japanese animation (anime), graphic novels (manga), related gaming, and pop culture. For general inquiries, please contact the Information Desk at info@otakuthon.com. 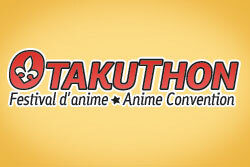 For all registration questions, please contact registration@otakuthon.com. Otakuthon is a festival run by the fans for the fans and the organization is non-profit. Therefore, we need a bit of help from our dedicated volunteers to make sure all our attendees can have an enjoyable weekend. Hence, we have put in place a volunteering program for the volunteers for those who are interested in helping us. Are there any advantages to this program? Of course! We have benefits, a partial or full reimbursement on the membership badge, valuable professional experience, a capacity of organization and responsibility, the opportunity to work in teams, make friends and learn a lot on the flow of the convention. Badge Checkers: Responsible for checking people's badges in and around the convention to make sure people are allowed in. ID Checkers (volunteers to be 18 years and older): Same responsibility as Badge Checkers, but also responsible for checking for proper proof of age (18 years and older) for rooms with mature content. Volunteers for this position could be asked to cover late night events (past 12 midnight). Bag Check Attendants: Responsible for checking in and out of bags for con-goers in a secured area and keeping the contents of the bags safe and sound. Room Monitors (for screenings and video games): Responsible for surveillance of the screening and video gaming rooms and reporting problems if they arise. Sharp eyes and good observational skills are an asset. Setup, Cleanup & Support Crew: Responsible for helping with setting up before the convention, cleanup during and after the convention, moving things from area to area when necessary, helping around the exhibition hall, and other miscellaneous tasks. Registration Staff : In charge of the cashbox, enter date in the database and answer questions from attendees according to the registration policies. Exhibition Hall Staff : Keep a smooth flow in the hall, help during the setup and tear down, verify badges in the hall, verify if the merchandise is legit (dealers, artists) and assist directors if needed. Merchandise Table Staff : Participate to the sales at the Otakuthon official merchandise table, help during setup and tear down, keep sales inventories, answer customers’ questions. Garage Sale Staff : Help during setup and tear down, keep an eye on the tables, answer customers’ questions and assist the sales of items. Information Desk : Provide basic information and directions for convention goers on day of convention. Must be able to man information booth for a minimum of 8 hours. Must have good communication skills. Must be bilingual. Please contact volunteers@otakuthon.com if you are interested. Copyright © 2019 Quebec Anime Committee. All rights reserved. Stay up to date with our e-mail newsletter. Subscribe now for free!